The World Cup 2018 is set to be an exciting one as it could be experienced at home in near life-like clarity. That means a big screen TV could give you all the action, minus the queues for toilets and overpriced snacks. As you get bigger, the resolution of a TV is more important, since you want lots of detail as you’re effectively seeing everything closer. That’s why 4K UHD is a must. What if the feed from ITV or BBC is only HD, you ask? Most 4K TVs now offer upscaling where they are able to create high quality big screen pictures with a normal 1080p Full HD feed. FIFA has confirmed all games will be shot in 4K and HDR. The BBC tested a 4K and HDR (HLG) live stream on its iPlayer Beta so we may see at least some games in full 4K and HDR. With that in mind we’ve created a handy guide that’ll help you find the ultimate TV upgrade in time for the World Cup 2018. What is the best sized TV to watch the World Cup? This is a tough question to answer as there are a lot of factors, like your room size, features you need, quality of vision, aspect in the room, budget, design tastes and so on. But for the purposes of simplicity let’s narrow it down a few of the most important: price, design and features. Generally speaking, for most rooms, a TV needs to be at least 40 to 50–inches to offer the size of onscreen detail to be enjoyed even sat further away. Since the World Cup can be a social event, this TV might be in a larger room, or at least needs to be seen from more angles, so going above that 50-inch mark is probably a good idea. Since the price of big screen TVs has dropped so dramatically in recent years it really can’t hurt to go larger to make sure you get maximum immersion. That said, most homes are going to struggle to accommodate the 77-inch TVs out there right now. But more to the point that size is still more rare so the prices jump up a lot when you enter that level. Which brings us to pricing. How much should I pay for a new World Cup friendly big TV? You get what you pay for. This definitely applies to TVs as the more you spend the higher the picture quality and the overall size of the screen. Design can also be a factor that is enhanced by throwing money at it. However, TVs are cheaper than they have ever been when it comes to what you get for your money. If you’re not a stickler for the best of the best when it comes to quality then most TVs with 4K UHD, which can upscale from a HD feed, will do the job of enhancing whatever you’re watching – especially the football. Another factor to take into consideration when looking for a saving is motion quality. If you’re using this TV for the World Cup, you want to be sure it’s got a decent enough motion refresh rate to avoid juddering and ghosting around players. Some TVs can struggle to refresh the area around the player where there is green, which you can spot. So either test out the TV first, with football on, or read up on it. A high priced option to give you quality motion, resolution and the option of 4K and HDR is an OLED TV. You can pick up a 55-inch Philips 55POS9002 for £1,799, or go larger with a 65-inch LG OLED65B7V for £2,499. Alternatively, save money and go even bigger with an LED, like the curved 4K (but no HDR) Samsung UE55MU6220 for £579. For those that want a size in between there’s the 58-inch Panasonic TX-58EX700B with 4K and HDR for £649. 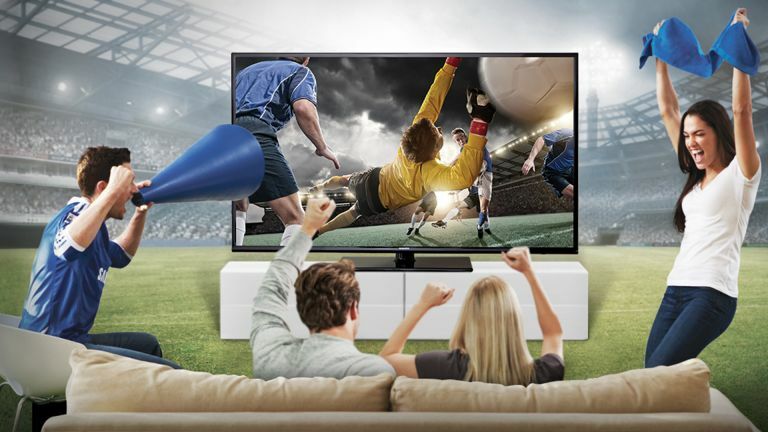 What features does my TV need for the World Cup? Aside from 4K and HDR, to future-proof the TV somewhat, the addition of a decent apps platform is a must. Smart TV apps are hugely popular now with options for catch-up TV, on demand movies, news, games and more. Some TVs can offer a social media feed so you can follow the hashtag action along with the on screen excitement. If the BBC does end up airing some of the games in 4K and HDR (HLG), then it’ll be on iPlayer – so having a TV that can run that is a must. Since most smart TVs offer apps and nearly every one of those has iPlayer, you should be safe. A curved TV could also be a consideration for wide viewing angles, ideal for a crowd watching the game. Of course with better viewing angles on more modern TVs it’s also worth taking that into consideration. One of the best layouts is webOS found on LG TVs. This is not only intuitively easy to use and multi-task with but it also has a handy Magic Remote, in some cases, that lets you point it about to select what’s on the screen quickly. The 55-inch LG 55UJ630V is a great affordable 4K and HDR LED TV that packs in this feature along with that excellent sized 55-inch display.